marina and beachfront suites, a small spa, and a freshwater pool, complete with terraced patios and pool/beach bar. "It's time for our family to take this incredible property to the next level", says long-time Summer Point owner Bobby Little. "I was raised on Rum, as was my son. 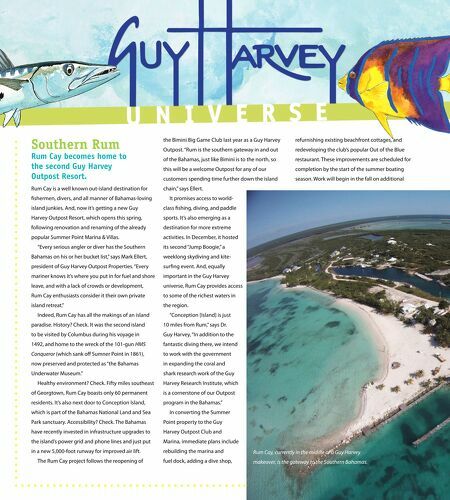 With our renovations and the support of the Guy Harvey Outpost brand and management, I expect our property to become a beacon for sustainable tourism in the Southern Bahamas. I can't think of a better legacy for our family, for the Bahamas, or for anyone who has come to call us their island home." For more information: (800) 737-1007; www.GuyHarveyOutpostRumCay.com Dr. 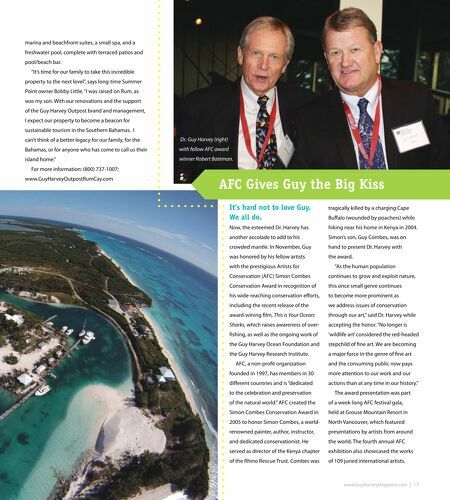 Guy Harvey (right) with fellow AFC award winner Robert Bateman. AFC Gives Guy the Big Kiss It's hard not to love Guy. We all do. Now, the esteemed Dr. Harvey has another accolade to add to his crowded mantle. In November, Guy was honored by his fellow artists with the prestigious Artists for Conservation (AFC) Simon Combes Conservation Award in recognition of his wide-reaching conservation efforts, including the recent release of the award-wining film, This is Your Ocean: Sharks, which raises awareness of over- fishing, as well as the ongoing work of the Guy Harvey Ocean Foundation and the Guy Harvey Research Institute. AFC, a non-profit organization founded in 1997, has members in 30 different countries and is "dedicated to the celebration and preservation of the natural world." AFC created the Simon Combes Conservation Award in 2005 to honor Simon Combes, a world- renowned painter, author, instructor, and dedicated conservationist. He served as director of the Kenya chapter of the Rhino Rescue Trust. Combes was tragically killed by a charging Cape Buffalo (wounded by poachers) while hiking near his home in Kenya in 2004. Simon's son, Guy Combes, was on hand to present Dr. Harvey with the award. "As the human population continues to grow and exploit nature, this once small genre continues to become more prominent as we address issues of conservation through our art," said Dr. Harvey while accepting the honor. "No longer is 'wildlife art' considered the red-headed stepchild of fine art. We are becoming a major force in the genre of fine art and the consuming public now pays more attention to our work and our actions than at any time in our history." The award presentation was part of a week-long AFC festival gala, held at Grouse Mountain Resort in North Vancouver, which featured presentations by artists from around the world. The fourth annual AFC exhibition also showcased the works of 109 juried international artists.